Lupita Nyong’o last week flew her mum and dad all the way to United States for the premier of her new horror movie “US”. 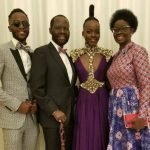 Her parents, Kisumu Governor Prof Anyang’ Nyong’o and his wife Dorothy Nyong’o, attended the premier at the South by South West Film Festival and apparently were scared out of their seats. “My mom was terrified watching this film. In fact, she watched with her eyes and ears closed so she hasn’t really seen it,” Lupita told American press. Lupita confessed that she likes scaring people a lot including her mother. “When she came from Kenya, I made sure I scared her. I lay in front of her bed before she got to bed and I got up like ‘Are you looking for me?’. She was so scared.” In US, Lupita stars alongside Winston Duke in what has been hailed as one of the most thrilling films to be released in years. The post Lupita Nyong’o: My mom was terrified watching “US” she watched with her eyes and ears closed appeared first on Ghafla! Kenya.